The Dyson V6 Fluffy is a cordless vacuum cleaner that reliably absorbs both coarse debris and fine dust. 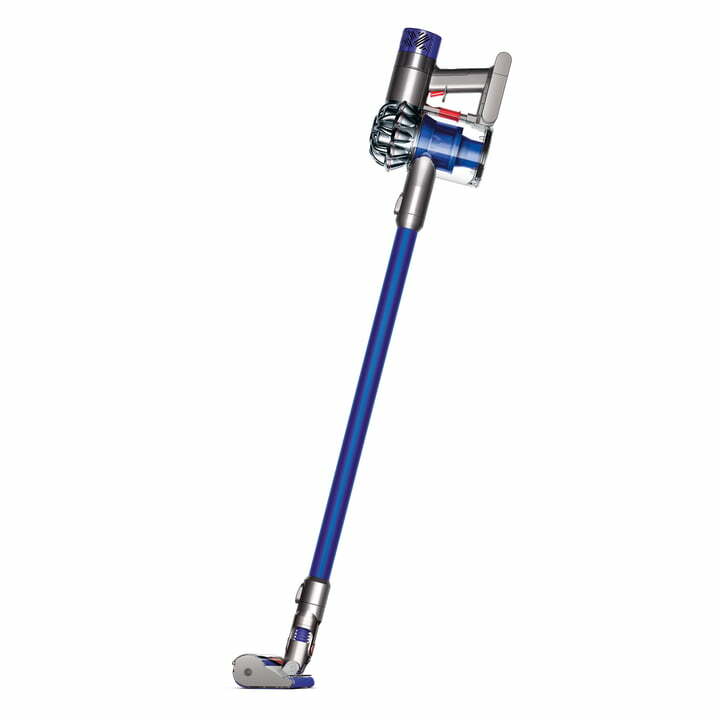 The hard floor specialist impresses with a strong suction power and long-lasting battery life. With the DYSON Digital Motor V6, the vacuum cleaner is three times more powerful and efficient than common motors. Two cyclones work at the same time in two radial tiers, in order to increase the air flow and to be able to absorb even more microscopic dust particles. The powerful motor operates with pulse technology and a Nedym magnet, which rotates with up to 110,000 revolutions per minute. 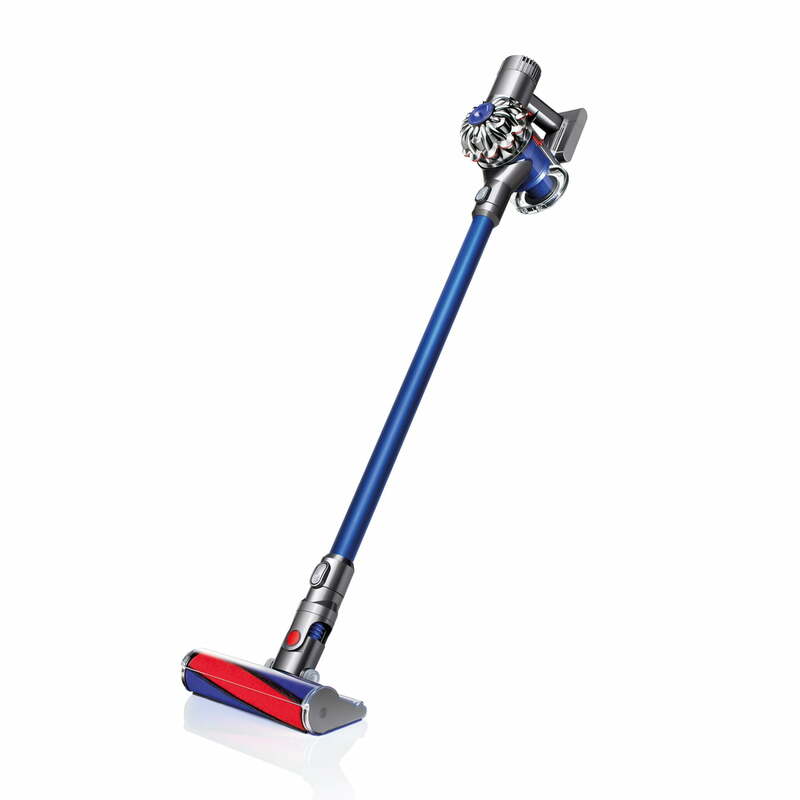 Thanks to the small size of the v6 motor, the Dyson vacuum cleaner is light, small and yet powerful. Up the ceiling, down on the floor and for gaps: With the removable wand, even hard to reach areas and corners can be cleaned in a flexible and easy way. After the vacuum cleaner is emptied by simply pushing a button, the wireless vacuum can easily be stored on the wall holder with charging station, thus taking up little space. New for the v6 Fluffy: post motor filter - filter for cleaner exhaust air. Ideal for allergy sufferers. Electric brush with soft roller: full-width coverage by motorised floor nozzle with soft roller (30W). Soft nylon, with rows of anti-static carbon fibre filaments enabling collection of fine dust. Ideal for all requirements on hard floors. 2-piece accessory: combination nozzle and crevice nozzle for cleaning hard to reach spots. Operating time up to (standard / maximum mode): 20 / 6 min. With the Dyson Digital Motor V6, the vacuum cleaner with motorised cleaning head is three times more powerful and efficient than common motors in a hoover.